THE Spanish Civil War ended when General Francisco Franco’s iron grip squeezed the last drops of hope from the country in April 1939 . . . didn’t it? 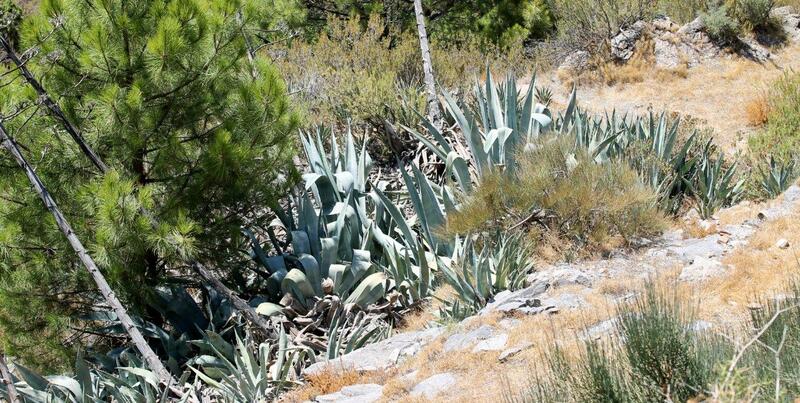 Or did the bloodshed continue into the 1940s and 1950s in the wild and rocky mountains of Andalucia? That’s an intriguing question, and to unearth an answer I need to pull on my boots, head for the high sierras and poke about in some recent and extremely raw history . . . This is a ramble that follows two paths into the past. The first is a challenging climb up a mountain pass that was a major mule trail until the 1950s; the second is a journey through an intriguing book called Between Two Fires, by David Baird. The book documents a guerrilla war that was launched in Spain just before the Allies set a limit on how many fascist dictators they were prepared to remove. Hitler had to go – that was assured. Mussolini got his comeuppance at the hands of his own people. And Franco? Well, Franco was sort of neutral during the entire conflict – despite sending troops to fight the Soviets on the eastern front. And it was this neutrality of convenience that allowed him to remain Europe’s sole fascist dictator until the nasty piece of work died in November 1975. Not that I have an opinion. Which brings us to a little-known chapter of history that begins shortly after the Allied victory at El Alamein. In 1943, Spanish communists freed from Vichy concentration camps in north Africa and then trained in guerrilla warfare by the US, landed in secret on the Spanish coast and melted into the mountains. They called themselves the Maquis, after the rural guerrilla bands of the French resistance. But to the peasants of Andalucia they were known as la gente de la sierra – the people of the mountains. Backed by the Russians, they fought a long and desperate campaign against the government, waiting for the day when Hitler was toppled and the Allies marched over the Pyrenees to oust a weakened Franco. Unfortunately, the Allies changed their minds. The Maquis fought on. 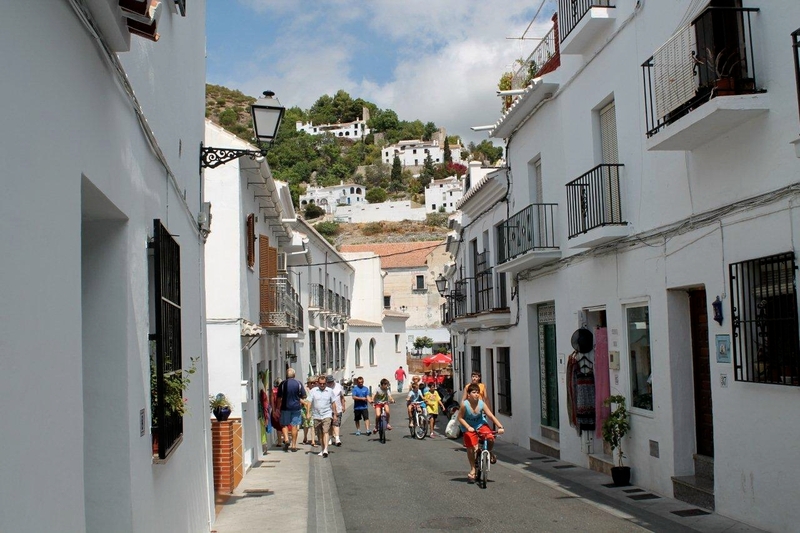 My walk begins above the white walls of Frigiliana, a village that wallowed in an almost mediaeval depth of poverty until the tourist industry brought sudden prosperity. 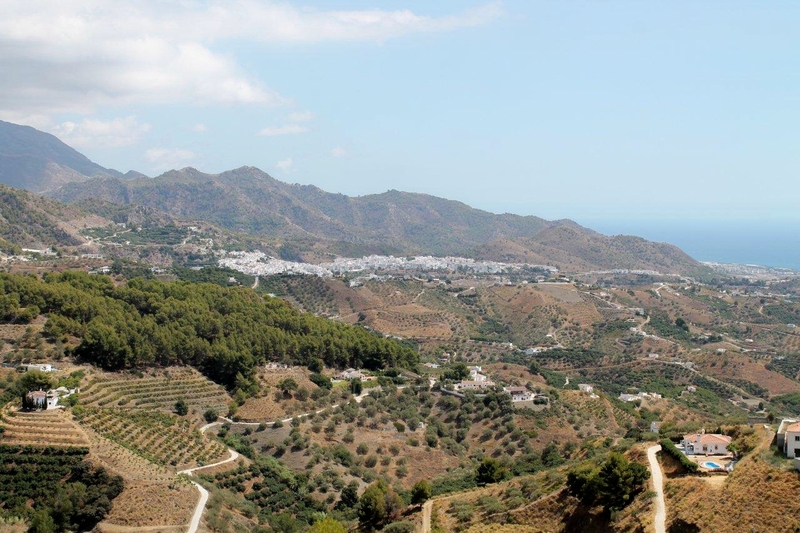 Frigiliana suffered tragically during the Civil War and the guerrilla conflict that followed. Sit today on its restaurant terraces drinking Alhambra beer and sipping gazpacho and it’s hard to believe that things were ever different. But they were. The sun is rising as I drive through the village. I pull up suddenly because in the middle of the road is a man with a mule. This sets me up no end because here is a man with a working mule, and I’m off into the sierras to walk an ancient mule route. I give him an involuntary wave, the automatic gesture of recognition that singles out kindred spirits passing in the mountains. He plods by with complete indifference. Getting back to the nitty-gritty of the walk, let me introduce you to guidebook writer Charles Davis. Some of you may be familiar with his work, but his book, Walk the Axarquia, is a first for me. Davis’ route descriptions are extremely detailed and he possesses an entertaining sense of humour. 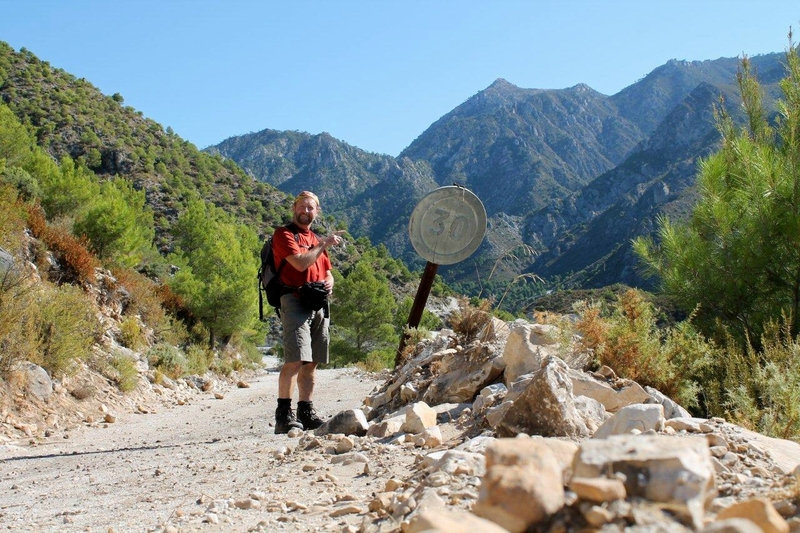 I’m following his route to Puerto de Frigiliana, a high pass in the Sierra Almijara over which mule trains picked their way taking fish and goods from Nerja (another impoverished village that’s now a major tourist destination) to the city of Granada. 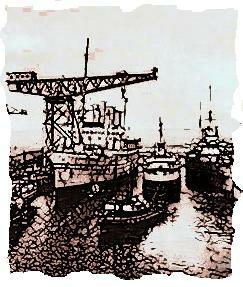 Trade was brisk for many hundreds of years but went into steep decline in the 1950s when the road network was improved. But before I pull on my boots in the abandoned marble quarry where Davis advises me to leave the car, I’ll let you in on the real reason I’m undertaking this walk. On a grassy ledge high in the mountains, just before the final pull over the pass on the crest of the Sierra Almijara, sits the ruin of what we British might call a tavern, a wayside inn, a hostel for the hardy folk who passed this way on their journeys to the villages and towns of the Spanish interior; the muleteers, the goatherds, the wayfarers, the trading folk who might seek a bed for the night, a plate of beans or just a swift drink. 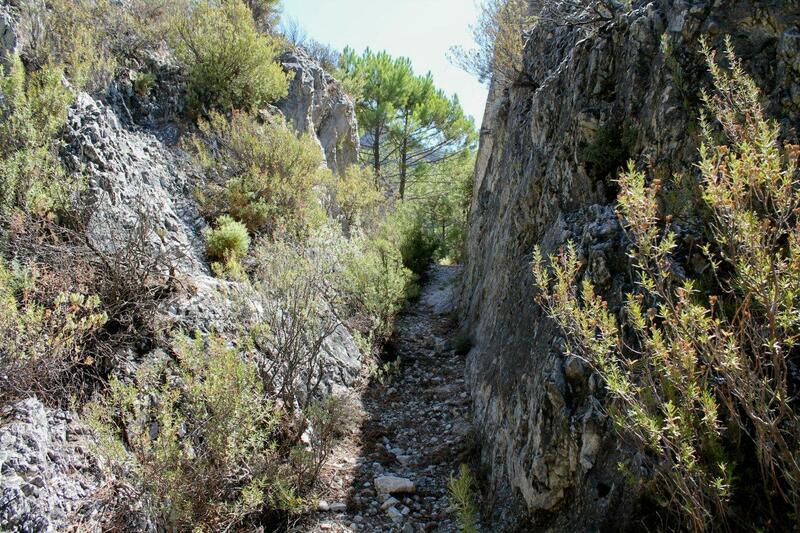 It was known as the Venta Panaderos – and in its final gasp of activity before the route faded into history, it was a haunt of the Maquis and the Civil Guard who hunted them down. The venta is pictured on the cover of Baird’s Between Two Fires (see below), and I have an inexplicable yearning to sit in the ruins, gaze out upon rocky peaks and soak up the atmosphere. I set off in my clumping boots along dirt roads that slumber in the early-morning shade, and after a couple of miles of twists and turns pause to photograph Cerro Verde, pictured right, a hill where a particularly ferocious battle took place during the guerrilla war, with the rebels positioned on the summit and the government forces in the scrubland below. I labour up a dry stream bed then follow more dirt roads to where the land suddenly drops away to my right, revealing a panorama of mountain scenery. This is spectacular stuff. 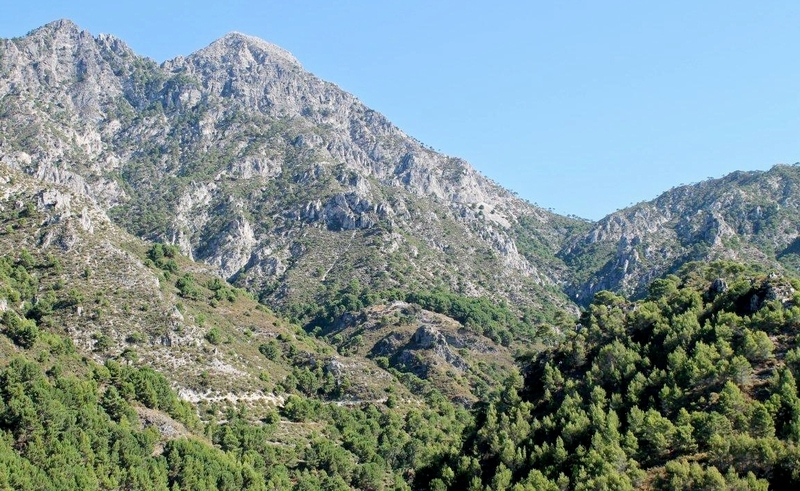 The Sierra Almijara and Sierra Tejeda – known collectively as Sierra Tejeda y Almijara – are the immediate neighbours of the Sierra Nevada, the highest mountains in western Europe outside the Alps. 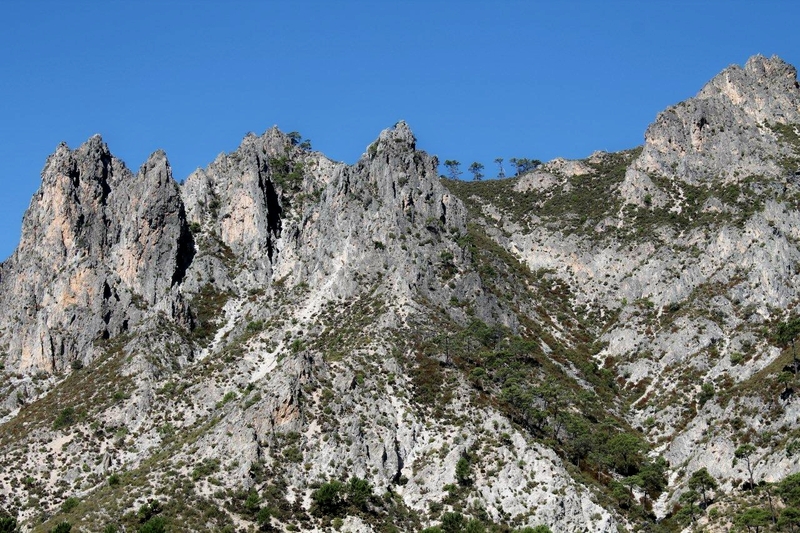 They look like mountains should: steep rocky pyramids scarred by deep ravines and surrounded by pine forests. They are not particularly beautiful mountains. But they are wild and impressive. I pass the ruin of the Venta Camila, pictured above, another abandoned wayside inn, and from here I can just make out the ruins of the Venta Panaderos perched high on its shelf (below, right in the centre of both pictures). 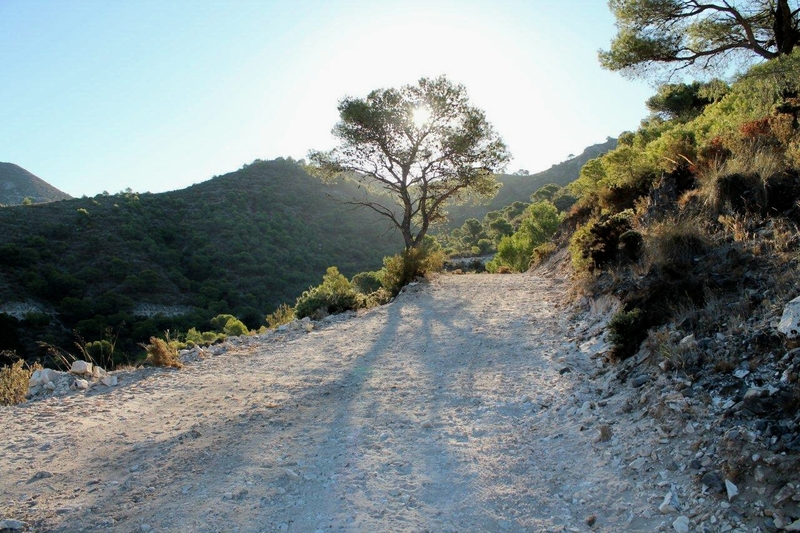 According to Davis, the dirt road leading to the pass skirts several hundred feet beneath the ruin, the original track to its terraces now overgrown with brush and a prickly shrub resembling gorse. 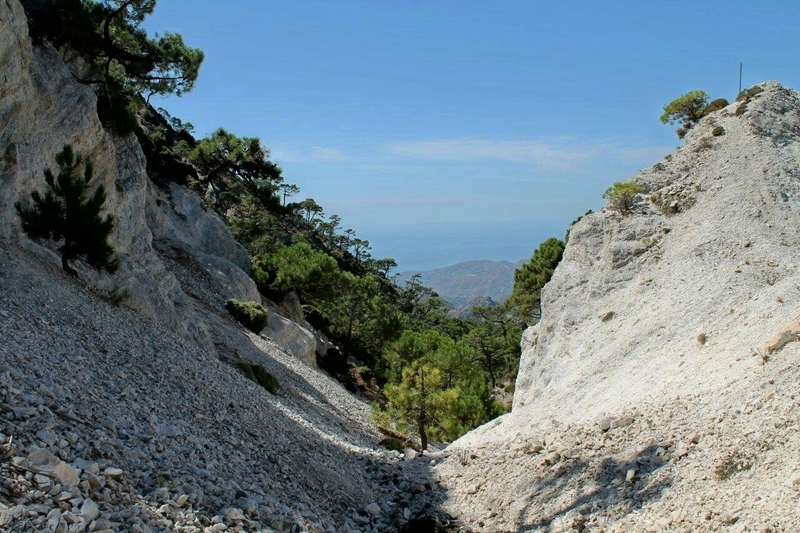 Unable to locate the old route in the undergrowth, and not feeling inclined to scramble up scree and crumbly crags in the baking sun, I resolve to make directly for the Puerto de Frigiliana, following a path that zigzags up the steep mountainside and passes through gullies hewn from the rock just wide enough for mules to pass. 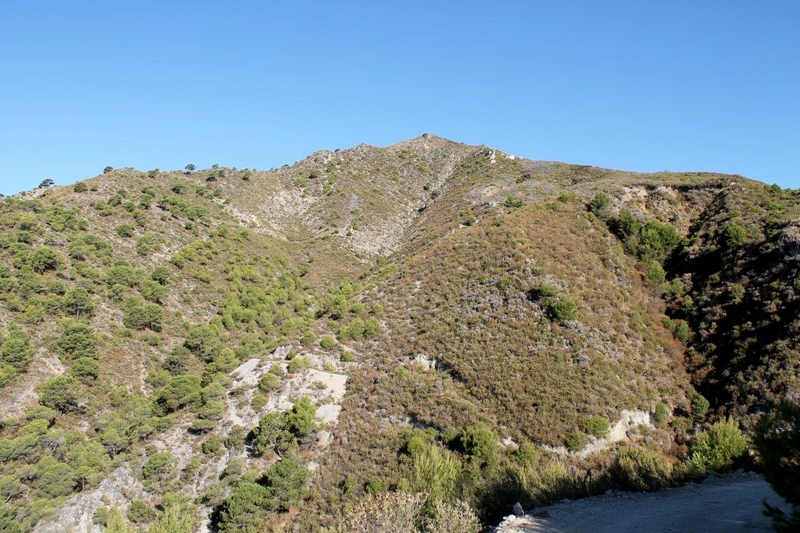 The crest of the pass – the actual gap where the Puerto de Frigiliana (pictured below) opens into the hinterland – is a bit of an anti-climax. My thin and winding mule trail is swallowed by a dirt road that snakes up from the woodland of the northern slopes. There is no romance in roads that a four-by-four can quite easily negotiate. So I turn about to make my way home. But my journey is not over. Blundering through the brush down the steep zigzag path, I stumble upon the abandoned track to the Venta Panaderos, and within minutes I’m sitting beneath its ruined walls eating fresh bread, chorizo and goats cheese on sunny terraces that look out over silent forests and the distant haze of the Mediterranean. To la gente de la sierra, the Venta de los Panaderos must have seemed like a mirage, that solitary building lost amid precipitous terrain where a traveller could enjoy all the luxuries he dreamed about, food, warmth, drink, soft beds. The inn has entered into the mythology of the sierras. A few decades ago, men with guns and grenades sat in this same place, waging their guerrilla war against the Franco regime. According to Baird, the proprietors of the venta, Paco Manuela and his wife Ana Herrero, were republican sympathisers, and one of their daughters, Dolores, was said to be the lover of the local rebel band leader, Roberto. It could be the stuff of a Hemingway novel. Except it’s real. It’s ordinary people caught up in a tragic struggle. Roberto was captured by the authorities and executed in Granada in 1953. Time moves on, memories fade and paths get lost in the undergrowth. Now the Venta Panaderos is nothing more than a few roofless walls and heaps of red tiles among a scattering of pines, fig trees, scrub and cacti in the very back of beyond. It’s history. I’ll tell you something else. If ever there was a place, a silent, secret, almost spiritual place to spend a night in the mountains and watch the stars appear one by one and circle above your head, then this is it. What would I give to sit here while the shadows lengthen and an indigo haze settles on the distant sea, alone in the ruins and gazing out above the world? Sometime in the future, perhaps, when an opportunity arises, I’ll return to spend a night among the stones. 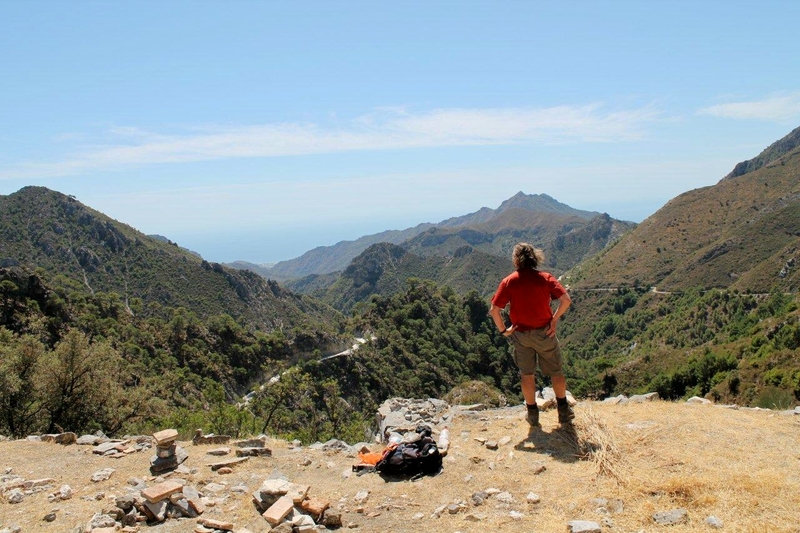 But today I’ve got to pick my way through the mountains and follow several miles of dusty tracks back to Frigiliana, leaving the Venta Panaderos to the ghosts, the breeze, and the stars that shine down. FINAL THOUGHT, FINAL LINK TO THE PAST . . .
IT’S 1am on Wednesday, September 19, 2012, and I’m just about to upload this post. I was trawling through news websites earlier this evening and came upon the obituary of a Spanish Civil War veteran who has died at the age of 97. His name was Santiago Carrillo. He fled to France after Franco’s victory and became the leader of the Spanish Communist Party in exile, returning to Madrid in 1975 on Franco’s death. 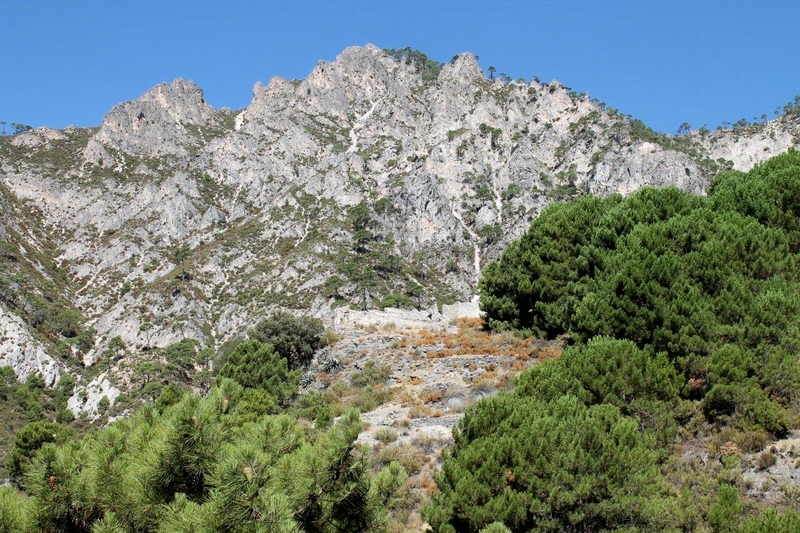 In the 1940s, Carrillo was involved in organising the secret invasion of Andalucia by guerrilla forces and would have taken part himself if he had not been ordered to France instead. He was one of the key movers behind the events in this article . . . History isn’t always in the past. History is an endless road and we’re all shuffling along it at different speeds. DAVID BAIRD, journalist and photographer, has written several books about Spain, its history and geography. For more information about his book documenting the guerrilla war in the Spanish sierras, Between Two Fires, and how to order a copy, visit his website at Maroma Press. 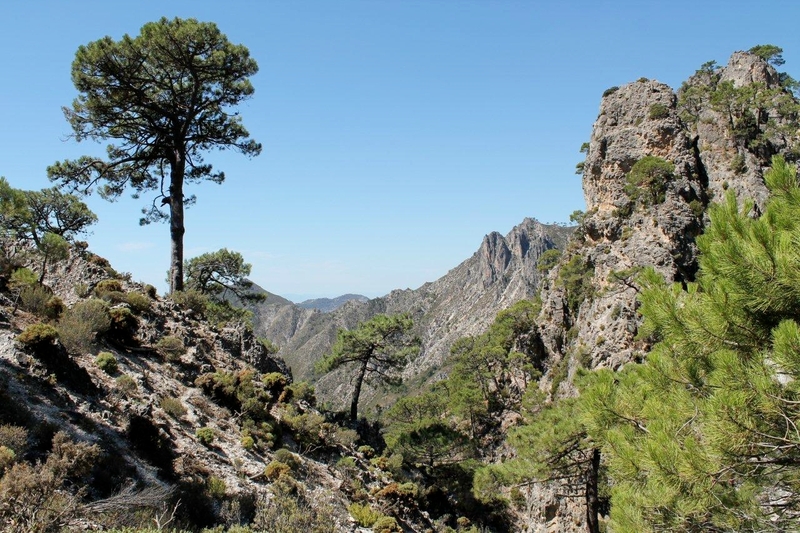 FOR Charles Davis’ guidebook Walk the Axarquia, and the accompanying 1:40,000 map of the Sierra Tejeda y Almijara at a very agreeable price for the package, click here. 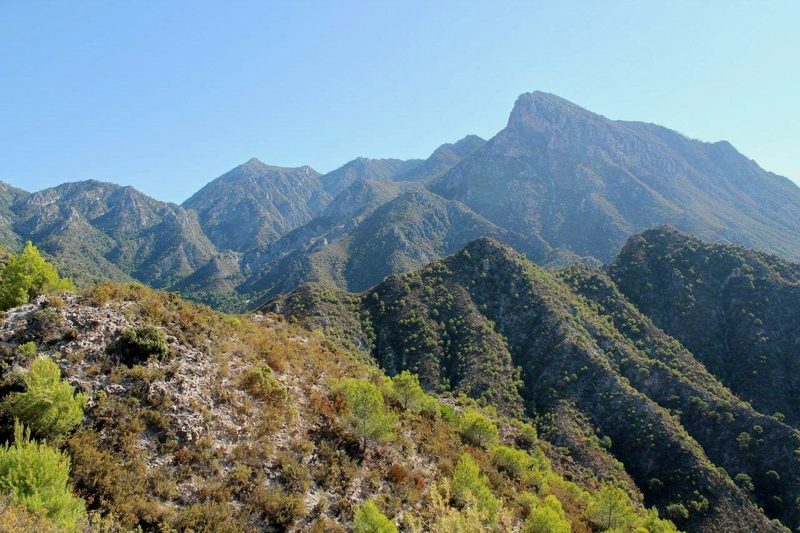 This entry was posted in Climbing, Hiking, History, Life, Mountains, Politics, Spanish Civil War and tagged general francisco franco, outdoors, Sierra Nevada, Sierra Tejeda y Almijara, Spain, The Pyrenees. Bookmark the permalink. You’re absolutely right, John. Things just keep going round in circles. Lust for power, religious fanaticism, social inequality, ethnic cleansing – chuck one or all of them in the pot and off we go again. Same old story. The weather was good, though. Alen. Thought you must be away, hope you had a good holiday. 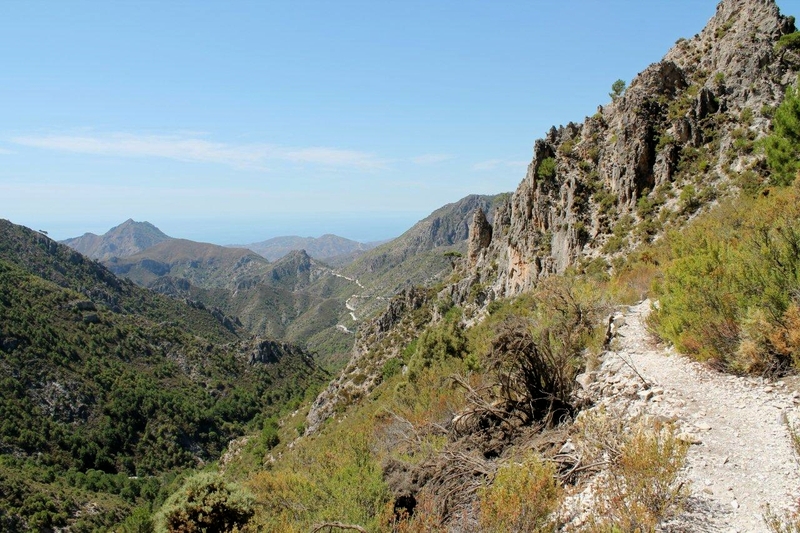 Looks a great place, once did a cycle tour of Andalucia, but further inland near Granada. Love the little bars you can pop into for a drink or a coffee. That sun looks great, we went to Orkney and I think I had the cag on every day. Sorry about Orkney, Greg. I think they had really good weather up there earlier in the summer, as well. Yes, I like the little bars, and the all give you tapas with a drink. Mind you, you’d need all the energy you could muster for cycling around there because it’s very hilly, even up around Granada. And that’s before you take the heat into account. 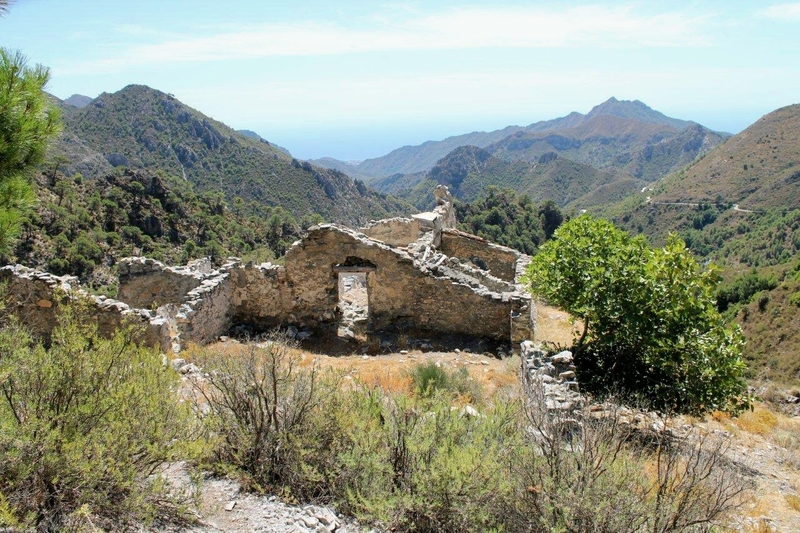 I have seen such derelict buildings while wandering in the Spanish hills and have often wondered about the lives of the people. It must have been quite moving to know the history and stand in the same place these people did. It also shows how transient their lives were and in a few decades there will probably be nothing much left to remind us of the significance of this place. Hi David. 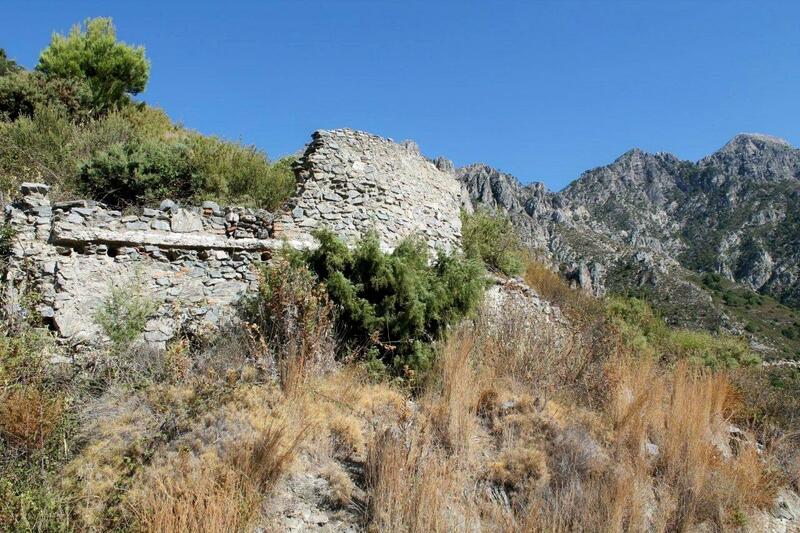 Yes, there was another quite significant ruin just below the crown of the pass but I can’t find any reference to it. There are little ruins dotted everywhere, much the same as there are in the Lakes, where people once sheltered, raised a family and even made a living. It was a different world back then. It was great to see a new story from you in Reader. 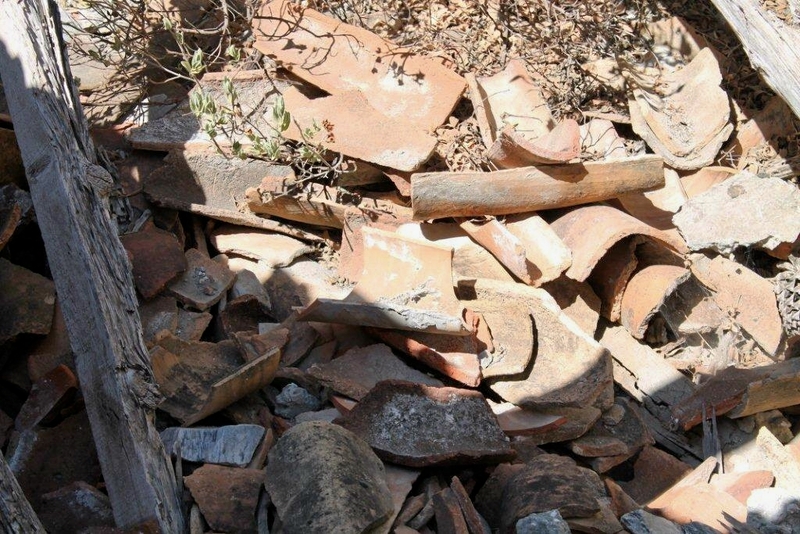 It’s an interesting story about the post-historic Spanish Civil War. It must have been a very fascinating experience to stand by the remains of Venta de los Panaderos. I’m tempted to read the book Between Two Fires. Hej Hanna, good to hear from you. I’ve always been interested in the Spanish Civil War and have read many books on the subject, but I’d never heard about the subsequent guerrilla war until I read Between Two Fires. I found it a fascinating book on several counts; firstly because it was about a struggle that never made the headlines outside Spain; secondly because it concerns a part of the world that many people know as a tourist destination but was steeped in abject poverty only a couple of generations ago; thirdly, it opens little windows into how ordinary people lived and felt in that situation. It’s well worth getting hold of a copy. A lovely and educational post as usual. I was reminded of our trip to Croatia last year where we sat scoffing ice cream on a terrace surrounded by bullet holes and over looking the trenches used by the fighters in the Balkans war. I remember thinking then that In the long view of world history these things happened only this morning. Hi Karl. Yes, that is very recent. It’s weird to to think that a country can be at the centre of a bloody war one moment and a tourist destination the next. I was walking the Southern Upland Way with my son when the Balkans crisis erupted. It seems like only a couple of years ago. I quite fancy visiting Croatia. I’ll pencil it on the list. 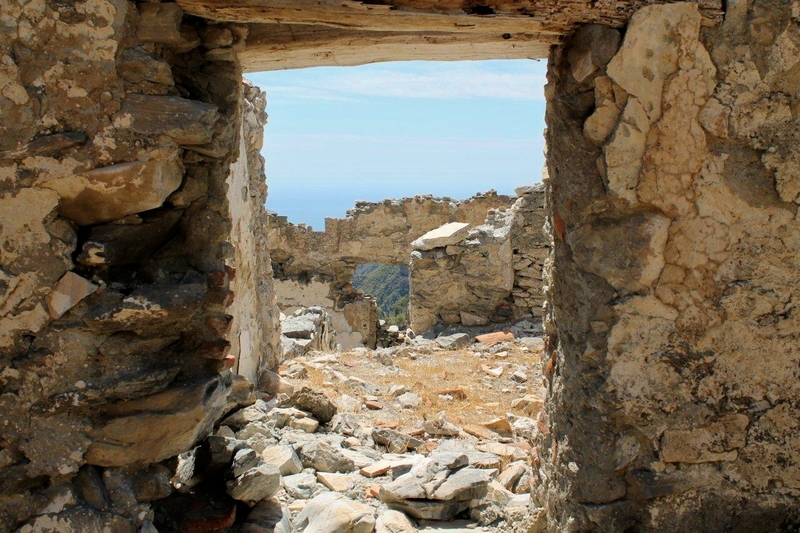 This post really interested me, it was like you say,it was real & actually happened, you re-lived it with the old mule routes & beautiful photos of the ruined buildings & the staggering mountain scenery. H Paul. Thanks very much for that. It makes it all worthwhile when other people find my ramblings interesting. And yes, it is a very beautiful part of the world and one I shall keep going back to. I thoroughly enjoyed that, Alen. I kind of saved it up for when I had time to read it properly, and it repays that approach. I also now have a detailed mental picture of an indifferent mule man, which is a first. Scott, you mean to say you don’t have indifferent mule men up there in Scotland? Well that does surprise me. Anyway, thank you for your comment, which I appreciate greatly. Very informative. Have you considered a career in journalism at all ? I`ll have to get a copy of that book I think.What I do have is a 2 hour documentary which was aired on Scottish Television a year or two back with interviews with the few remaining International Brigade volunteers and some original footage from Spain.I can hopefully copy it ,despite my limited pc skills, and send it down to you if you haven`t seen it.I`m not sure if it was shown south of the border. Hi Alex. The book’s a really good read – very detailed and containing interviews of people who lived through it. I haven’t seen the documentary, so if it’s possible to do me a copy I’d be really appreciative. Good article, Alen. And not just because you have given my book, Between Two Fires, such a generous plug. I have lived on the edge of the Sierra Almijara for quite few years now. It’s a great area for hiking and escaping from the overcrowded coast. The best aspect for me is that within minutes of leaving my house I am in a wilderness area, home of vultures, eagles and the bones of those guerrilleros who died in a hopeless struggle against fascism. Thanks for that David. It really is a wonderful area. Having walked there a few times since reading your book I’ve come to appreciate just what a wild place it is – and so close to a major tourist destination. I can see now how people could hide for years in those mountains away from the eyes of the authorities.